India more prosperous than China ! Most of you must be aware that China’s per capita income (average income of an individual per year) is more than double of India – India’s is close to $3000 whereas, China’s is close to $6000 (after accounting for purchasing power parity). In short, average Chinese citizen makes double the money than average Indian citizen. However, India is more prosperous that China – and that is a fact. In reality, prosperity does not mean only having more money, but there is much more to it including the well-being and freedom of an Individual. Hence, rightly so, India ranks well ahead of China according to the latest Legatum Prosperity Index – Unlike other studies that rank countries by actual levels of wealth, life satisfaction or development, the Prosperity Index produces rankings based upon the very foundations of prosperity – those factors that help drive economic growth and produce happy citizens over the long term. In overall rankings, India ranks at 45th as compared to China’s 75th rank out of total 104 countries ranked. A combination of a large labor force and very low foreign direct investment as a percentage of GDP could provide a possible explanation for the extremely low availability of productive physical capital per worker. Even though the source of India’s export revenues are manufactured goods rather than raw materials and natural resources, generally its terms of trade remain weak. India’s domestic saving is moderately high, and household expenditure as a percentage of GDP is robust enough to sustain a significant domestic market. With only 11 formal business start up procedures and approximately 20,000 new businesses registered in 2007, India ranks 34th on this variable, having a favorable environment for entrepreneurship. However, India suffers from a weak communication infrastructure. India scores well on democracy variables compared to other countries at similar income per capita levels. Ranking in the top 40 with respect to political rights and slightly lower regarding civil liberties, Indian citizens enjoy moderately high levels of freedom to participate in political processes and express their political beliefs. India scores highly on levels of competition in selection processes for the legislative and executive branches and has a fully independent judicial system. India’s above average score for political checks and balances places this nation 44th on this variable. The country’s regime has been in place for over 50 years, ranking the country 21st on this variable of political stability. Primary and secondary education enrolment rates are quite low in India, placing this nation amongst the bottom 30 countries in this measure. Tertiary enrolment rates are similar at a mere 12%, placing India 77th on this variable. India also performs poorly on the number of students per teacher – there are approximately 40 students per teacher in primary education. There is also very low education expenditure per students, which places India amongst the bottom 30 countries worldwide. The girls to boys enrolment ratio indicates a strong bias towards male enrolment in schooling, with just 91 girls for every 100 boys, ranking the country 92nd. Severe underinvestment in medical facilities is shown through the lack of adequate doctors and hospital beds per capita. In fact, India ranks amongst the bottom 30 countries according on these two variables. While only 28% of the population has access to improved sanitation facilities, 69% claim that water quality in India is high. * Approximately 20% of the population are undernourished, placing this country in the bottom 26. Infant mortality rates are very high. India faces significant problems related to refugees and internally displaced individuals, and is ranked 56th in that measure. Insecurity in terms of state-sponsored violence and torture is a significant problem, placing India’s ranking in the bottom 15 countries worldwide. Although homicide rates are about average at four homicides per 100,000 people, just 5% of Indians reported having property stolen in the previous year, the second-lowest proportion worldwide. Just 2% were assaulted, ranking 12th, and nearly three-quarters of the population feel safe walking the streets at night, a high percentage, globally. India’s performance in terms of bureaucratic quality and effective implementation of policies is average. In terms of regulatory quality and enforcement of the rule of law, India ranks 68th and 46th out of 104 countries, respectively. India’s high ranking in this category is mainly a product of the high membership rate of its citizens; between 59% and 68% of the population report that they belong to a variety of community organizations. While only 23% of Indian citizens believe they can trust others, and just 64% believe they can rely on family and friends – an extremely low percentage compared to the rest of the international community – most find friends to be very important. Very few respondents declare that they have given donations or volunteered and only 28% claim to have helped strangers in 2008. Levels of religiosity are rather high in India, placing this country in the top 35 countries worldwide on this variable. Finance Friday: How Infosys made Billions – Made Millions for its shareholders too ! India Is World’s 6th Wealthiest Nation; Beats Others In Wealth Creation Growth! In Ravi Park, Hadewadi Rd., Hadapar Pune..
Mr. Jayesh Jain, Builder of the Ravi Park. Still not provided any kind of Gym, Personal Parking, come amenities, also given delay possession of flats. Kindly let put your comment rgds what the people do against builder. “Ravi Park” Handiwadi road, Hadapsar, Lift Available Without Genrator Backup, no Corporation Water, Peaceful Location with full of Light & Ventilation. Lets not kid ourselves we are 10 years behing china on a per capita basis and 20 years behind it on social issues such as literacy,access to basic medical care etc. Only when we realize this will we begin to close the gap.This report is euphemism based on intangibles we should only compare things that can be measured otherwise its not a comparison only opinions! Alright, India is more prosperous. Accepted 100%. can India hold Olypic games even in next 20 years that China has already done? can we shine Bombay skyline like what Bejing is today even in next 50 years? can India control its population as China has already done? can India ever, ever compete with China’s per capita income? Income is something which decides 95% of stuff in ones life-including prosperity- if you living in this world!! Chines are repressed, Indians are not. Chines communistic system is rediculous, India’s democracy is awesome but even then the end results are not good for India as they are for China? Does trak.in has a report on the issues responsible for this difference? personally speaking I dont agree with what report says, and I’d say that the factors which are chosen for deciding prosperity aren’t very apt from India’s perspective. 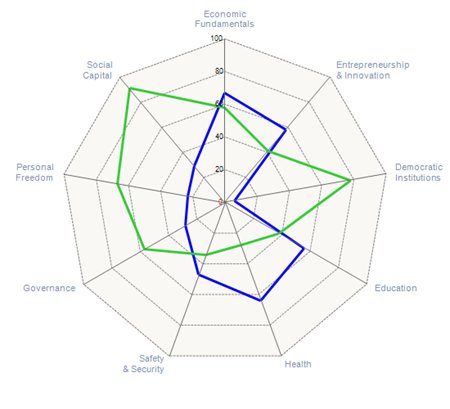 As we can depict from Graph, we are ranked higher in terms such as “Social Capital”, “Personal Freedom”, “Governance” and “Democratic Institutions”. These are basically feel good factors from other persons point of view but in reality they give no direct reference to India’s prosperity. We may have more personal freedom but that actually in terms of keeping our roads dirty, not taking care of public properties etc. When it comes to real freedom, we don’t have freedom to speak “Mumbai” as “Bombay” in a Hindi movie. We may be rated higher in Governance because of a democratic Govt here, but if anyone digs deep he/she knows the truth of Indian Governance. You already gave the reasons behind high score in Social Capital. Democratic Institutions is another fake word in my opinion, it has no real significance to India’s prosperity. When it comes to real and direct factors like “Safety”, “Education” and “Health”, India is ranked low as against China. That’s exactly where our focus should be. It’s not the time that we should get happy by seeing such reports, they do nothing more than creating a false impression. India can’t be rated more prosperous than China, that’s a fact which we have to digest!! Valid points you have made. Let me ask you one thing here…would you barter your citizenship for Chinese instead of Indian? I would be wary of a country where there is huge amount of repression, especially when it comes to personal expression. Forget everything else – even Internet is censored to such a large extent that you will not be able to carry out many things in China that you take for granted here in INdia.